There are a lot of reasons to love Maleficent — childhood nostalgia and the charm of Elle Fanning among them. But, the real draw is Angelina Jolie in the role of the titular villain. The actress plays evil better than almost anyone, yet somehow it's hard to hate her. Call it her special talent. But, slipping into character wasn't as easy as adopting a frightening cackle and banging her scepter. Becoming Maleficent was a process involving all sorts of costume designers, makeup artists, and even a milliner. In other words, it literally took a village. According to the flick's director Robert Stromberg, Jolie was very passionate about what the character would look like. "We worked together to come up with a character that wasn't the stereotype image but was close enough that people would immediately know her to be Maleficent," he said. 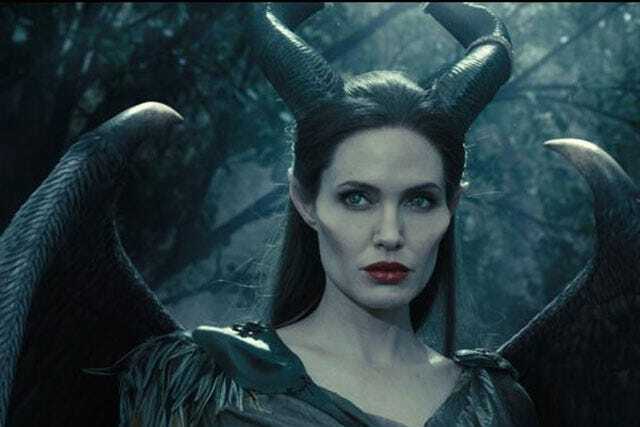 Jolie wore the character's recognizable cape ensemble, but the creepiness factor was upped considerably by very realistic pairs of horns and wings, as well as a silicone nose, cheeks, and ears. Makeup effects designer Rick Baker was in charge and says that, surprisingly, Jolie's fake face was the easiest part of it all — for her, at least. "It's amazing because the appliances are less than a quarter of an inch at their thickest parts," he said. "The horns were one of the big issues, because no one would want to walk around all day with big horns on his or her head." After much deliberation, the team finally decided on magnetic horns that could snap on and off in between scenes (after all, Angie's kids were on set and in need of some serious Mom time). Baker sculpted the horns out of molds of Jolie's head and then brought in milliner Justin Smith to make the covering as realistic as possible. Smith created six different looks for the different seasons and occasions in the movie (spring, summer, and Aurora's christening included) and used python and fish skin to make the entire look as eerie (and evil) as possible. Finishing touches to the transformation included Maleficent's nails, makeup, and accessories. Her shoes were made out of animal skin, feathers, and bones in keeping with the idea that the character is ever-so-slightly non-human, and she donned everything from collars, rings, brooches, bracelets, and shoulder pieces — all made of the same animal materials, of course. Jolie and her makeup team opted not to use Maleficent's signature green skin from the original Sleeping Beauty animation. "We still wanted her to look pretty and attractive," said Baker. "We didn't want her look to be too creature-like." Instead, Angelina donned hand-painted contact lenses and bright red lips. Finally, her personal makeup artist created custom nails for the flick — black with a pearlescent-like polish. For Aurora's christening scene, a.k.a. the moment of Maleficent's true transition into evil, Angie's nails were painted blood red underneath. 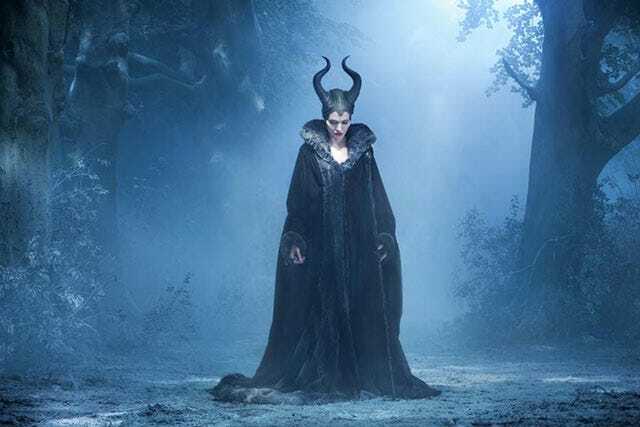 The entire process was incredibly successful — more than a few viewers will have Maleficent-centric nightmares after watching the movie — but it's safe to say that Angelina relished her usual no-frills look after filming wrapped. Because, well, evil easy does it.